Open Source Embriodery has been developed by Ele Carpenter to invite computer programmers and crafts people to skill-share across the crafts of computer programming, knitting and embroidery. The first workshop will take place as part of Connecting Principle 2007. 5 programmers and 5 crafts people will be invited to discuss and demonstrate ‘samples’ of their work. Open Source Embroidery is based on the common characteristics of needlework crafts and open source computer programming: sharing and modifying patterns / code; shared social process of development; transparency of process and product; obsessive attention to detail; valuing amateur and professional creativity. Whilst there is much research and debate in this field there are few projects attempting to engage the wider craft and OS community in discussion and skill-sharing. Embroidery is constructed in hundreds of tiny stitches, visible on the front of the fabric. The system of the stitches is revealed on the back of the material. 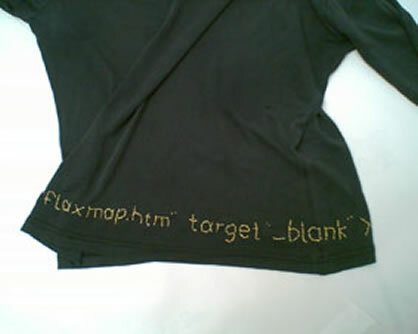 Some embroiderers seal the back of the fabric, preventing others from seeing the underlying structure of the pattern. Others leave the back open for those who want to take a peek. A few integrate the backend process into the front of the fabric. The patterns are shared amongst friends in knitting and embroidery 'circles'. Software is constructed in hundreds of tiny pieces of code, which form the hidden structure of the programme or interface. Open Source software allows you to look at the back of the fabric, and understand the structure of your software, modify it and distribute it. The code is shared amongst friends through online networks. However the stitches or code only make sense to those who are familiar with the language or patterns.